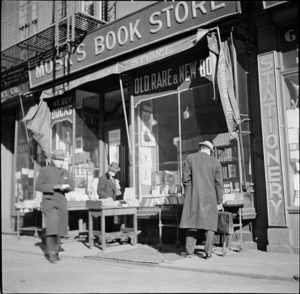 For those who are unfamiliar with the term Book Row, it is referring to ‘a comparatively small area of New York City, [a] collection of phenomenal booksellers who begun to ply their trade from the 1890s to the 1920s and beyond, on and around Fourth Avenue south of Fourteenth Street, in sight of the aspiring Grace Church’. In fact, 48 bookstores once spanned this segment of Fourth Avenue, earning it the title “Book Row.” However, these bookstores either relocated or closed entirely by the 1960s. ‘Yet they left an indelible mark in the lives of the book lovers fortunate enough to have visited them. They left their names in the diaries and the journals of bibliophiles, in the letters of collectors, in the archives of libraries, in the memories of readers who journeyed to Book Row America’. – extracted from the Forward of the novel, Book Row, An Anecdotal and Pictorial History of the Antiquarian Book Trade, by Marven Mondlin and Roy Meador. This book is a mesmerizing read, and descriptively rich to the sights, sounds and characters who made up Book Row, especially for one who has never had the luxury of ever seeing Book Row. 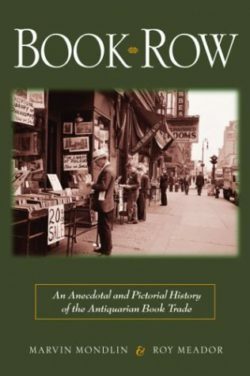 The text below, is the preface of the novel, Book Row, An Anecdotal and Pictorial History of the Antiquarian Book Trade, by Marven Mondlin and Roy Meador. The preface in the novel Book Row. 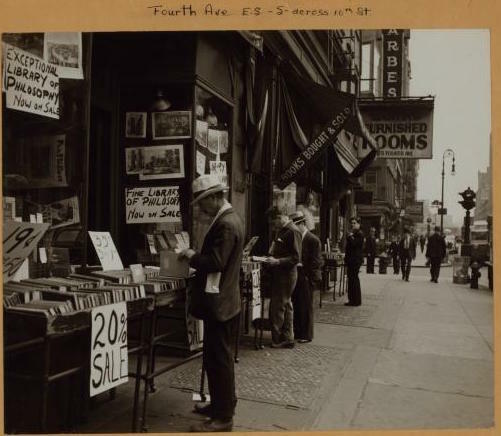 From the 1800’s the secondhand and rare book seller’s favorite New York City for nearly eight decades of slow decline – encompassed a special area on and around Fourth Avenue, mainly south of Fourteenth Street and Union Square to Astor Place. Seven concentrated blocks on Fourth Avenue, plus a few side streets stretching west to Fifth Avenue and north to Twenty-third Street, supplied crowded sites for several dozen bookstores. 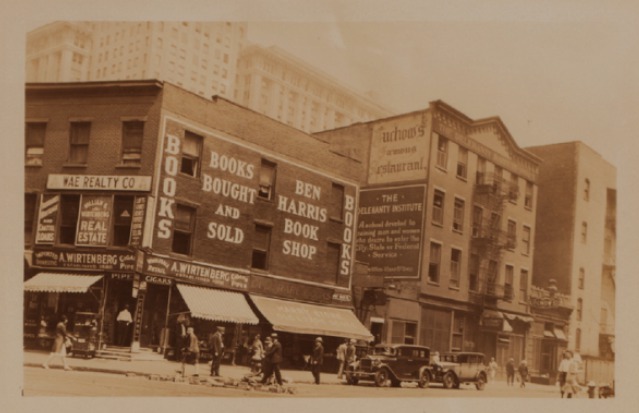 Book hunters and collectors – nationwide, worldwide – knew the neighborhood during those decades as the New York Booksellers’ Row, or more often just Book Row. 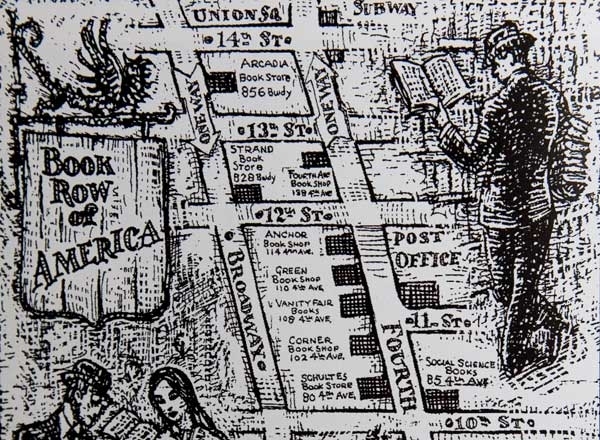 The booksellers, by design or destiny, craft or luck, settled in one of the city’s most fascinating and felicitous communities, north of the financial district and the Lower East Side, south of Herald Square, midtown, and the theatres of Broadway. For many, in memory, it is still Book Row. 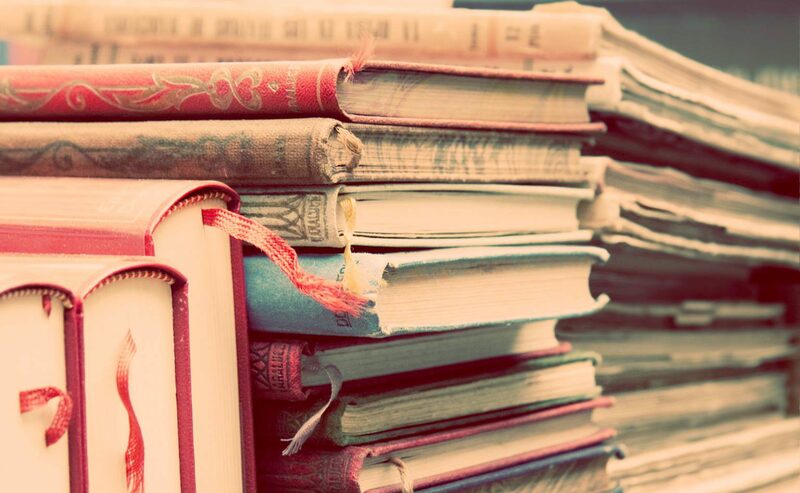 I have been a reader and a buyer and a borrower and collector of books all my life. It is more important that your work should go on now than it has ever been at any other time in our history: in a very literal sense you carry upon your bookshelves the light that guides civilization . . . books never die. No man and no force can abolish memory. No mam and no force can put thought in a concentration camp forever. No man and no force can take from the world the books that embody man’s eternal fight against tyranny of every kind. In this war, we know, books are weapons. And it is a part of your dedication always to make them weapons for man’s freedom. On Book Row they liked the sound of that. But along with the appreciation, Book Row being Book Row, there were no doubt rivulets of cynicism about the city’s bureaucratic sidewalk fanatics, concern about sales to cover rent, and the chronic aches and pains that daily beset every small business. In his January 1, 1944, “Trade Winds” column for the Saturday Review of Literature, Bennett Cerf wrote about a bookstore that prosperity passed by. One partner said, “I can’t understand it. Here we go busted, and only yesterday I read where President Roosevelt was saying business was never better.” The other partner said, “Maybe Roosevelt had a better location than ours!” That has an unmistakable Book Row flavor. Movie director Robert Benton, in Bookstore (1999), by Lynne Tillman, called working in a bookstore one of the greatest jobs he ever had but he admitted lacking to courage to run one: “The people who run these small bookshops, it’s heroic.” Again, in thought we dash back to Fourth Avenue, and memory revisits Book Row. Typically in a Book Row shop, the proprietor right off the bat wouldn’t or couldn’t say whether was available. You’d be directed to a section where the copy might be found. Of course, if you didn’t locate the title, you might find something else there to take instead. Some shops were impressive, specialized, antiquarian enterprises operated by highly knowledgeable bookmen; some were clean, orderly, general used-book stores with shelves packed full of promise; some were notoriously scruffy book caves where occasional worthwhile first editions and elusive titles awaited searching and patient eyes, along with thousands of unwanted volumes priced at a dollar, fifty cents, and even less. Or make an offer. Bargaining between proprietor and customer was never a complete stranger on Book Row. Congenial bargains for Book Row regulars were a taken-for-granted fact of life. On Book Row there was no appetite for being fussy about “used” and “secondhand” versus “antiquarian”. Such competing terms were simply alternative descriptions for books of varying quality, price, and appeal. They began their lives as new books, then moved on from earlier owners by way of Book Row to appreciate buyers – with a small profit staying behind in the cash drawer at the bookshop. Various Book Row proprietors and employees would have been quite comfortable at a university faculty meeting. Others would have to skip the meeting to see their parole officers following the release from incarceration for illegal anarchist activities. A few among Book Row personnel could have served plausibly in a pulpit; still others perhaps would have done all right joining Bonnie and Clyde and teaching lessons to bankers. Whether mad or slightly sane, Book Row dealers for the most part could not serve convincingly as templates or models for booksellers in the sentimental Roger Mifflin mode as depicted by Christopher Morley in Parnassus on Wheels and The Haunted Bookshop. Book Row was a place of businesses, and businesses more often than not are places of constant struggle and hard work. Valentine Mitchell in Morocco Bound (1929) wrote about the bookseller whose secret daydream was to load up on liquor, tell off Christmas shoppers, and when the celebrated bookstore sentimentalist Morley entered he had a special greeting in mind: “Morley pictures the life of a bookseller as one of ease in which the shopkeeper sits around smoking a pipe. I should like to have Morley pop in so that I could wring his blooming neck.” If Christopher Morley’s biblioenthusiasm veered somewhat from accuracy about day-to-day bookselling, especially at holidays, the shops on Book Row were glorious havens for many customers, and the proprietor could feel free to gripe as long as we could root among books. We viewed Book Row proprietors and their scouts, whatever their personalities and moods, as informed toilers in the trenches who attended the sales, searched the attics inspected the boxes, prowled along dusty shelves, heeded the clues, and followed the spoors to obtain the books that adorn collections, that enrich libraries, that entertain and educate readers. In the 1930 book collector Stan Nosek attended Stuyvesant High School on East Fifteenth Street with ten cents a day for the subway and “five cents spending money” from his mother. “It was a short walk to Union Square and then to Book Row,” he recalled. “I loved to walk over there and browse among the book stalls.” Even with just a nickel a day to invest on Book Row he could slowly acquire books to read and treasure. David A. Randall, a rare-book dealer whose reminiscences are in Dukedom Large Enough (1979), discovered Book Row as a boy and began there as a book scout rummaging for cheap finds to sell for a profit at posh uptown bookstores. One of his discoveries in the twenty-five-cent bin was a nondescript work by Whittier that had a verse in Whittier’s hand on the back flyleaf. The store owner, cantankerous Peter Stammer, going through hundreds of books, had understandably missed the fact it was a presentation copy. Young Randall then learned the wisdom of not impetuously bragging, at least not in the victim’s presence. When he showed Stammer the inscription he had missed, the bookman seized the book, tore out the flyleaf, and handed back what was then legitimately a twenty-five-cent buy. Stammer, famous for his warm heart as well as his temper, repented by giving Randall a part-time job, thus furthering the education of an eminent American bookman. Such stories lightly lend credence to one picture of certain Fourth Avenue bookmen as entrepreneurs who wandered ashore when the Spanish Main broke up, ending their careers as pirates, and who then opened bookshops on Fourth Avenue for themselves and their scalawag descendants. Many other stories challenge this character portrait. Book Row was host to most psychological types among its denizens. For every dealer who would just as soon kick you out as let you browse, there was another who was easygoing. For those growled, there were the gentle souls who were polite and even kind to doubtful purchasers. Frederick Lightfoot began buying books on Fourth Avenue in 1935, when he was fifteen. “Books on stands were priced at as little as one cent in the 1930’s. A nickel or a dime would buy a variety of books. It is impossible to convey to someone born in the last twenty years the quality of life as well as the treasures of old Fourth Avenue,” he reminisced in 1989. Among Lightfoot’s favorite bookmen and bookshops were Alfred Goldsmith and his basement emporium, Sign of the Sparrow. Lightfoot recalled that one of Goldsmith’s customers was a collector of books on angling. After Goldsmith learned with some astonishment that the collector had never gone fishing, he took him on a fishing trip to New Jersey. The next week the experienced and hence disillusioned collector brought in all his angling books to sell. Ordering customers to be gone; taking a collector fishing, defacing a book in a fit of pique; amiable tolerating a student browser – these and countless more incidents became the human drama and comedy of Book Row. Bookmen, like their customers, never quite fit a clear-cut stereotype of any sort. They were human and, depending on the day, the dealer, and the book involved, were likely to assume a niche somewhere between a sinner and a saint. A durable if never quite sufficient tagline for New York City is “There are 8 Million stories in the Naked City,” thanks to a Mark Hellinger film and the television show Naked City. The Green Book Shop, started by Ruth and Harry Carp, was featured as background in one episode of the gritty crime series. The following day, perhaps due to the publicity, the store was robbed. So it went some days on Book Row in the naked city of 8 million stories and countless books. In the preface to his Memoirs Ulysses S. Grant in 1885 wrote, “There must be many errors of omission in this work, because the subject is too large to be treated of in two volumes in such a way as to do justice to all the officers and men engaged.” A similar apologia is apropos for a volume about Book Row. This work focuses on colorful booksellers and bookstores from the 1890s into the twenty-first century. Inevitably some individuals and establishments associated with Book Row are omitted or are incompletely covered. The recollections of others who were there may generously complement those that follow. Across the decades many books flowed through Book Row from sellers to dealers to buyers and around again in a continuing cycle. With each came a story. This book records some of them as it commemorates a time and place where books mattered more than anything else among a special group of colorful and memorable individuals. Here is a link to the book if you would like to purchase it and read it in full. I brought you this book today in the Collector’s Blog because I could hardly put it down! It actually made me feel like I took a time warp back into the 1930s, in book row. Reading this book I was carried off into the streets of Fourth Avenue and found myself worrying about whether I was going to upset a proprietor or be welcomed into their shop to hunt for my very own ‘book-gold’. You get the next best thing to actually physically being in Book Row, you can read about all the colorful people who ran these individual shops. It should have probably scared me off from wanting to open my own Bookshop but it had quite the opposite effect, it put the desire-bug to acquire my own physical bookstore more than ever (Ash Tree Books does not have a physical store front….yet!). Regardless of whether you own a bookstore, want to, you are a collector, an avid reader, or just like to read about interesting people, this is one hell of a good read. (Please excuse the language but it really was quite exciting for a Bibliomaniac like myself!). So whatever happened to Book Row anyways? (In case you may be asking). The shortest answer is found in a nutshell on the back flap of the dust jacket of this book. It reads: Rising rents, street crime, urban redevelopment, even, television – are all reasons among many which are given for the demise of Book Row, but in this volume, based on the interviews with dozens upon dozens of the book people who breathed its rare, ‘bibliodiferous-air’, it lives vibrantly again. In the crowded bookshops of Fourth Avenue. In books, you’ll find what you are looking for. In books is that which makes existence more. Our hopes in life are often in an old bookstore. Is now in Weider’s, rich mental gain. Surprise is waiting on Biblio shelves. And bring us news: the word that shines and delves. The same is true of all the other shops. In all their valleys, all their mountaintops. Come, then, and see what’s in Fourth Avenue. And what a page, a book, can do and do.